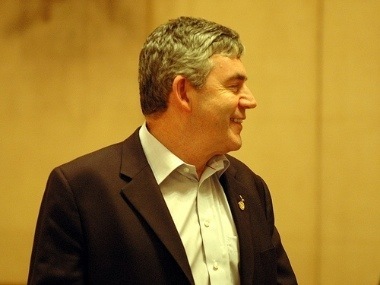 I hesitate to blog about politics, but am inspired to reflect on a post at the Coaching Commons blog about Gordon Brown’s handling of the post-election situation. My initial response to the post, written by a US observer, was to notice the folly of making coaching judgments about foreign cultures. The premise of the piece was a misreading of the British constitution, that Brown was clinging to office. As evidence, it offered, without scepticism, opinion drawn from Britain’s famously partisan press. Clinging to office Brown may have been. But he was also prisoner of the vacuum at the heart of power, unable to leave until it was clear a new government could take Labour’s place. As it turned out, the premise was undermined almost as soon as the piece was published, with Brown announcing his intention to resign so as not to stand in the way of any possible deal between his party and the Liberal Democrats. Nonetheless, there was clearly truth in the reading of Brown as a control freak who undermined his own strengths of resilience and the drive to leave a virtuous legacy. This much was confirmed by Andrew Rawnsley’s book, The End of the Party. The more interesting aspect of the analysis was the focus on Brown as an introvert: more energised by working with small groups of people than large groups, who would tend to exhaust him. The piece highlighted how his failure to work with the grain of this characteristic led to an inability to draw out his strengths. This rang true for me. I often puzzle at the disparity between the Brown we came to know in office and the earlier rising star that was such a force in bringing Labour in opposition back from the brink of oblivion. As a reporter in Parliament in the 1990s, I observed Brown as a formidable communicator. The benches of the House of Commons, routinely two-thirds empty, would be packed for one of his set-piece speeches. These combined razor-sharp analysis with acerbic wit in their deconstruction of the Conservatives’ reputation for economic competence, after they had presided over the humiliation of sterling on the foreign exchange markets. Here was a man comfortable in his own skin, able to function in front of a crowd but not beholden to it. Required to perform on the national stage, he would rise to the occasion. But he could retire sufficiently to his own space not to be overcome by the energy-draining demands of public service. The Blair years changed all that. Not simply because they represented the vanquishing of Brown by his mentor. They also established Blair’s extravert style as the zeitgeist. Blair was clearly energised by being with people and and connecting with them at levels far beyond the political discourse. On the death of Princess Diana, Blair was the conduit for a very public mediation of emotion the like of which Britain had not experienced – at least not in my lifetime. A succession of Conservative leaders could no more grasp this style of leadership than Brown; until David Cameron arrived in similar mould to Blair – informal, open and emotionally literate. By the time Brown reached prime ministerial office, the dye was cast – to the extent that he felt himself forced to ape the style rather than play to his own. Operating outside his comfort zone would have exacerbated Brown’s worst tendencies to bully and control – the only ways left to influence the situation he was supposed to be leading. It needn’t have been that way if he’d made more effort to lead with authenticity – making more of a virtue of his downbeat, austere style rather than deploying his awkward rictus grin at alarmingly inappropriate moments. This uncollegiate leader needed to be able to rely much more than he did on others, more relaxed in public, to carry his party’s message. It may not have ended differently, but it may have been less painful – for him and for us. As it was, there was a severe disconnection between himself and the British people, and a failure to influence successfully the people around him. Nonetheless, the downsides of Brown’s leadership can be overstated. The banking crisis may have been partly of his own making, but he showed courage and judgment in his response to it. He led the world in containing the risk – as he had done earlier in prompting western leaders to alleviate third world debt. These areas of high policy allowed his strengths – his intellectual mastery, his powers of rational persuasion – to come to the fore. Appropriately enough, it was when he was most alone – staring defeat head-on – that he showed consummate political skill and leadership. Reportedly, he had decided as early as Friday, the day after the election, to step aside. He demonstrated astute timing in waiting until Monday to announce this. It was an act which combined both statesmanship and low political cunning. It recognised the likelihood of a coalition of his opponents taking power, but created enough room for the alternative – a Liberal Democrat deal with Labour – to be tested. Had that alternative succeeded, he would have kept his party in power. The gamble failed. But the eventual, and always more likely, outcome was rendered more legitimate as a result of the best deal Labour could offer having been put on the table and found wanting. Before it reached this point though, Brown’s act had electrified the negotiations between the parties and immediately elicited concessions from the Conservatives which significantly moderated their governing agenda. So Brown left office in the knowledge that he had secured, from a bad hand, what he could view as the most progressive result possible. The pictures from inside Downing Street in Gordon Brown’s final hour in office tell the same story. He was reconciled to departure and this reserved, introverted Prime Minister was relishing a return to private citizenship. This is the first of a pair of blog posts on the leadership lessons of the 2010 General Election. Part 2: David Cameron and Nick Clegg.